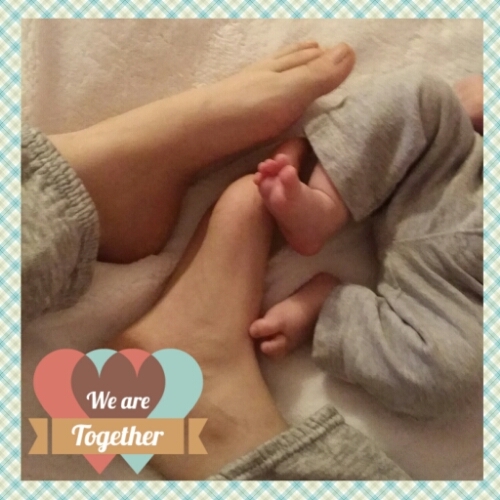 Today my little one discovered that playing footsies with mommy is fun. I keep reading the articles that have those week-by-week baby updates and they seem to be really off when it comes to Ace. He has discovered that touching things with his feet is fun, but doesn’t want to use his hands to touch his feet which is supposedly the first thing babies want to play with. My little guy already smiles like crazy, especially if he is seeing me – or his dad for the first time in the day. He’s oohing and ahhing a bit too. Ace also has started reaching and grabbing for his sensory toys, as well as holding onto my sleeve when laying up against my chest. These 3 things are expected to happen around month three, and not before month 2 ~ Ace will be 2 months old in a week! I’m taking every moment in and cherishing them. This entry was posted in Fourth Trimester, Newborn, Newborn 101, Postpartum, Pregnancy Journal. Bookmark the permalink.